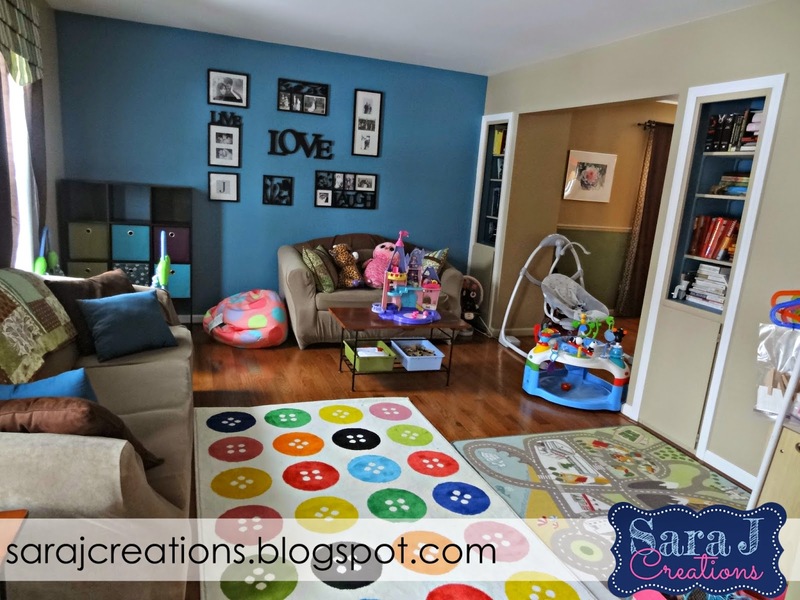 Our playroom is finished...for now. 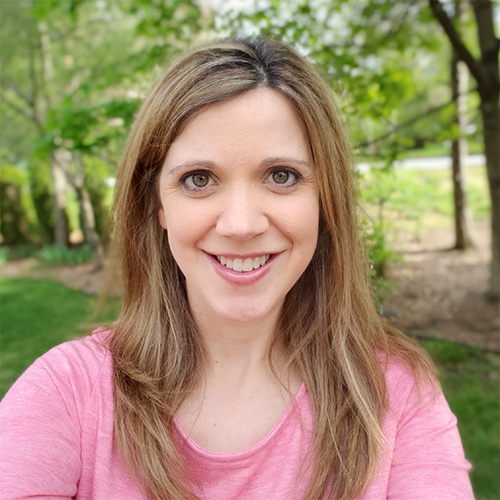 And ready for the big blog reveal. *Note: the toys are picked up for this picture...it is normally a hot mess of toys. This is the view when you first walk in from the main hall. We have a closet and the new gallery wall. The pictures on the blue wall used to be where the gallery wall was until a few weeks ago. 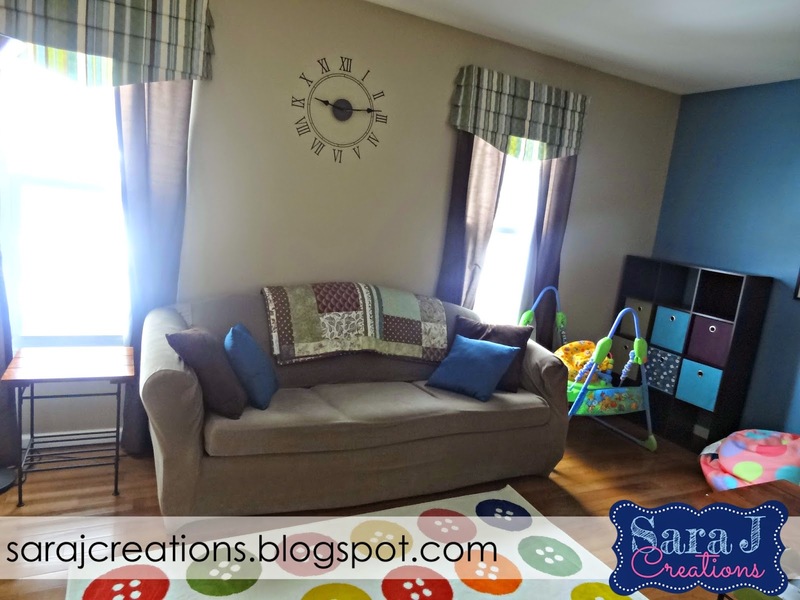 My husband painstakingly moved it over to the other wall and centered it over the couch and then two days later we decided to turn the room into a playroom. I told him to leave the collage of frames and slide the couch over and I would just deal with it being off center. View of the room. The rugs are both from Ikea. Yes there are baby toys (swing, jumping seat and exersaucer) that my kids are too old for. We didn't know where else to put them. They take up so much space. We didn't want to take them apart because my nephew can use them when he comes over each week. So for now, they stay in that room and my crazy kids still play on them. Don't super love the couches but I'm told they aren't going anywhere. Hmm. I hated them when we moved in. They were hand me downs from my in laws and they didn't match our style at all. So I found slip covers and I've dealt with it. The quilt and pillows (on the other couch) were a wedding gift and we based the colors of the room on them when we set up the formal living room. My mom made the curtains. We decided to keep all of that instead of starting from scratch. 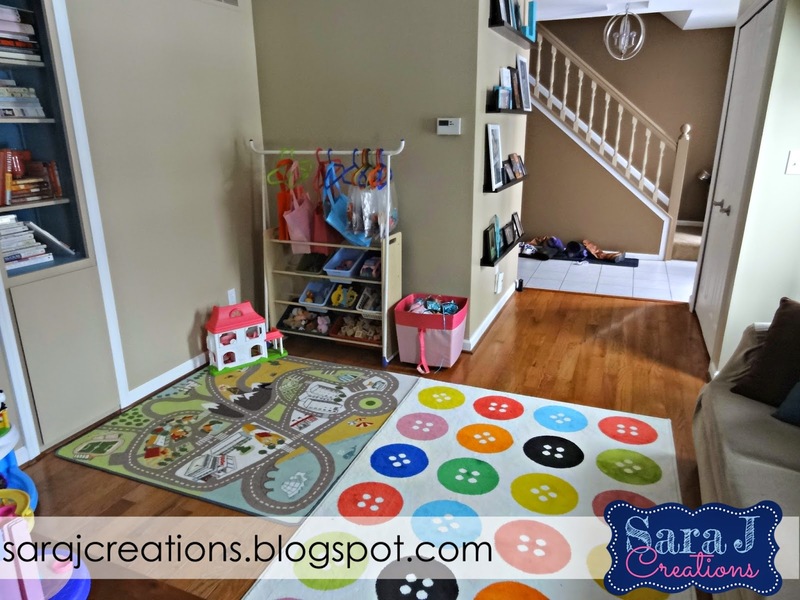 We bought the cube shelf and boxes from Target to match the old colors and the new colors from the button rug. I like that it is mostly empty so we have room to grow in the toy department. This is the view looking at the main hallway. We kept our books in the built in shelves (in order by color) instead of bringing in kid books. We figured the girls have bookshelves in their rooms and we didn't have anywhere else to store adult books, so they stayed. This wall used to have our piano on it. We moved it to the dining room. I don't super love it there but I like the extra space in this room. 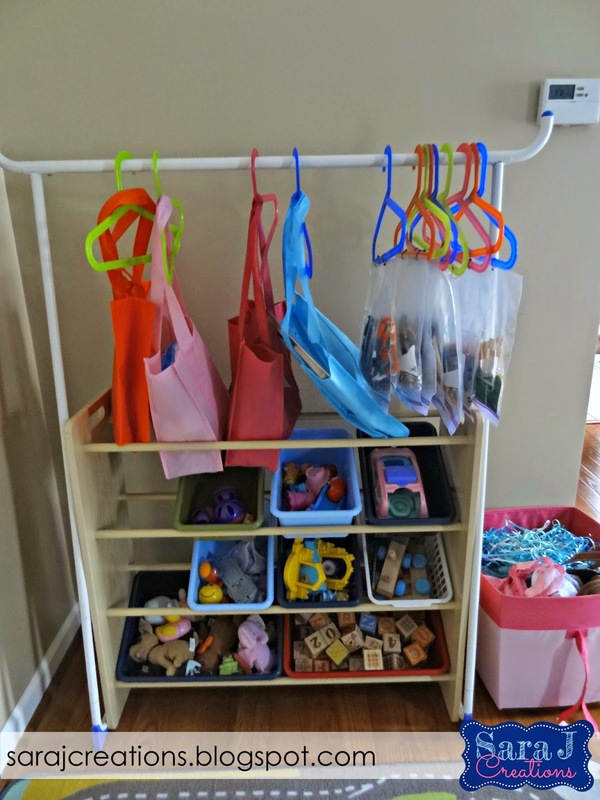 The toy holder with the clothes holder over it was something I used to use in my classroom. The hanging bags are busy bags. 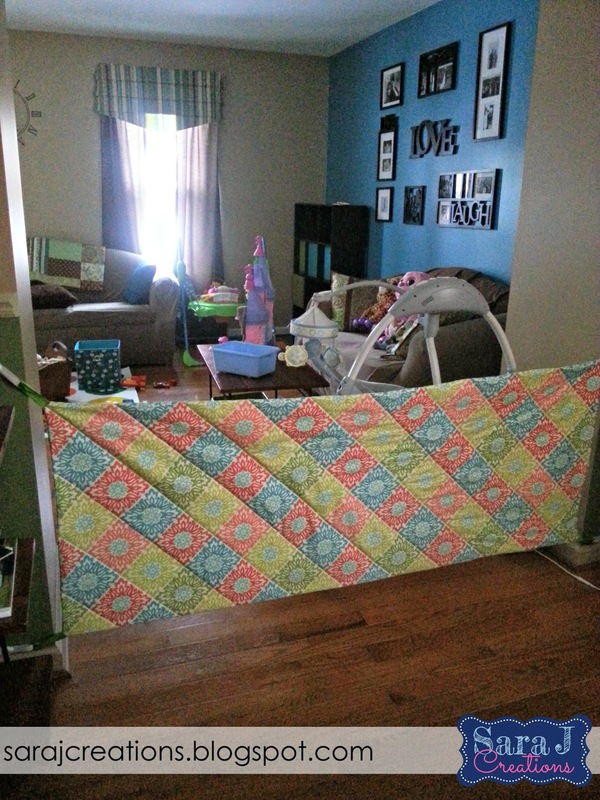 I decided I needed something to keep the kids in and block out the mess from my view. 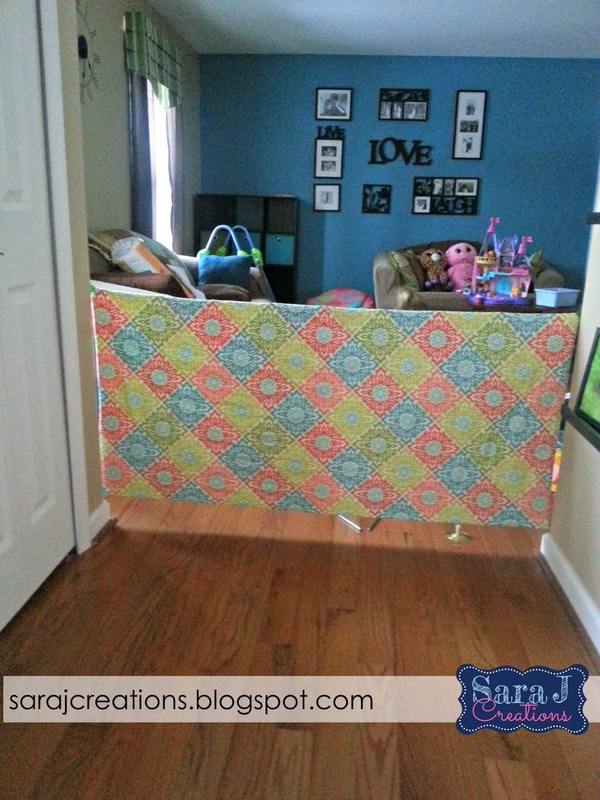 The openings were too wide for a normal baby gate. I found these on Pinterest and had my mom make them. Day one the girls learned to climb under them and escape. Ahh. I've since lowered them and it helps but they can still escape. I guess I never really thought it would contain them - just slow them down so I can be in another room and know where they are for the most part. 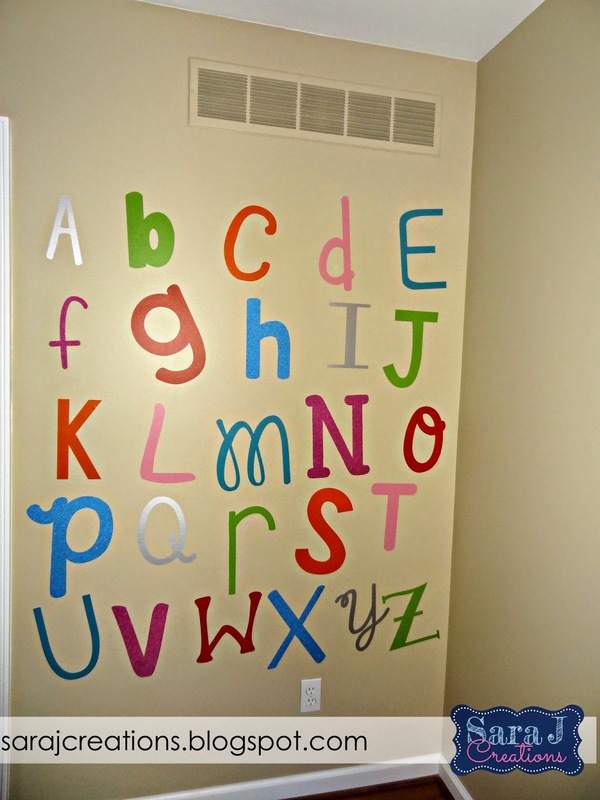 I decided to add an ABC wall. I LOVE the ones on Pinterest that have all different shapes and sizes of 3 D letters. 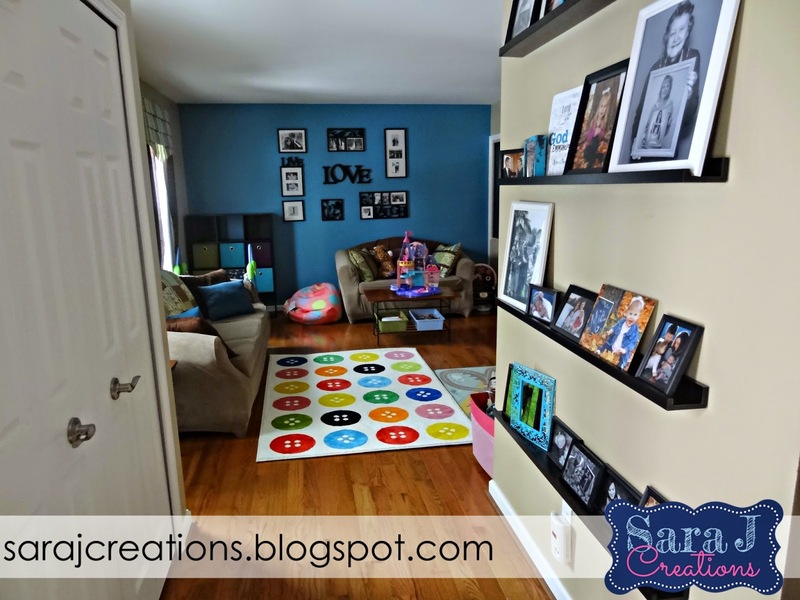 But that would mean a bunch of holes in the wall and I knew I was pushing my luck with converting the room into a playroom so I decided to use vinyl instead. I've got a more detailed tutorial coming soon. We still have a few more things to do in the room. Priority one is lighting. There is only one lamp in the room so it is not nearly enough light at night. We bought a cool Ikea light and have plans for a few others but they are going to involve cutting into drywall and adding wiring and lighting options to other parts of the room. That's going to be a little bit more complicated. It works for now. We have a new place to put the toys so the other rooms of the house aren't so overrun with toys.